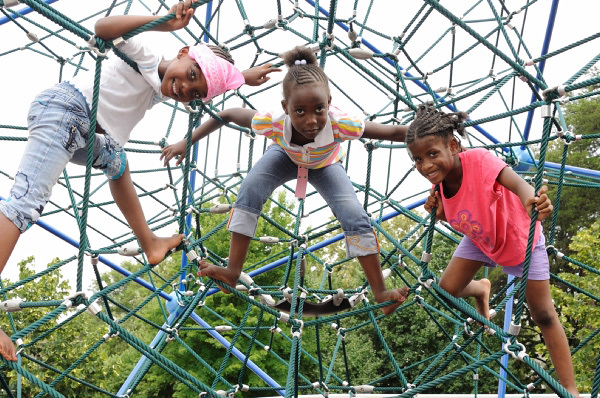 In 2008, Cleopas R. Johnson Park near downtown Atlanta was an underused space with an uninviting concrete playground. Local advocacy groups Friends of Cleopas R. Johnson Park and Park Pride asked The Trust for Public Land to bring new life to this four-acre park by finding ways to fund an improved design. We helped secure a grant from MetLife and partnered with the Atlanta Parks Department to design and install better playground equipment. The park reopened in 2011 and is now a fun and unique community gathering place for outdoor play. The playground's vibrant custom color scheme represents the four local colleges: Morehouse, Spelman, Clark Atlanta, and Morris Brown. The site also features the city's tallest climbing dome and the only circular "Neos" play equipment in the city park system.